Lenard Vernon Bunkelman fought a long battle against cancer before his last moments with us on Sunday, January 27th, 2019 at the age of 55. He passed in his sleep peacefully in his home surrounded by his family and friends. He is now fishing in the clouds. He came into this world on June 8th, 1963 and fish and game had already begun trembling at his name. “Bunk” was an avid outdoorsman that took pride in catching, hunting, and cooking his own food. He took pleasure in his work, doing just about every type of construction, from building houses to fixing fences. For many, work becomes life but for Bunk it was what he had to do to support his adventurous lifestyle. He has passed his passion for the outdoors down to his children and the many children of his friends who became like family. Lenard is remembered by his wife Traci, his children and their spouses Tania and Brian, Melinda, Scott & Amber, Brittany and Mary, Bryan, Ashley and Frank, and Haley. He leaves behind a beautiful caring granddaughter Ava, and many nieces and nephews, Tara and Glen, Anthony and Shamara, and his siblings Armin, Christine, Al, Eileen, Rita, Belinda, David, and Virginia. He was also especially fond of his bond with Sandie Brown and siblings; Jamie, Shelli, Heidi, Kim and Tammy, his wonderful in laws. He is preceded by his parents, Armin and Juosefa Bunkelman, and his best friend and brother, Robert Thompson, to whom he will rest aside as to continue their walk together with the Lord, while almost holding hands on earth. 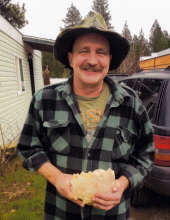 His graveside service will be held at the Pine Grove Cemetery February 2nd at 1pm; 6693 Idaho-53 Rathdrum, ID 83858. A celebration of life will follow grave side services at 2:30pm taking place at the Rathdrum Lions Club (right next door to the cemetery); 16114 N Meyer Rd. Rathdrum, ID 83858. Food and drinks will be provided. (maybe more to follow) The family has requested that you bring your best your memories of Bunk, especially the fishing and hunting ones to share and laugh with his family and friends. It soothes us to know that his adventure will always continue as he was never a complacent man. Everything he stood for was always for others and that desire will also continue on with his children and those he influenced. He was loved by too many to list, and loved even more than that, so it is with an easy heart that we will all continue our walks toward him in good hands and hold him close each in our own way. “Come follow me and be fishers of men” comes to mind as we continue to remember the friends that he nudged to walk their own journeys and improve their spirits. You will be missed. A special thanks to the family members that stood so strong in his care in his final moments and the union that you have brought to both families. Know that everyone including Lenard is as proud of you as we are of him. Your strength will only continue to grow on our bond as we continue to celebrate the union of our lives in Lenard, and the Lord. In lieu of flowers and gifts please plan fishing or hunting trips in his honor, and donations towards funeral expenses are welcomed and appreciated in person or towards Yates Funeral Home in CDA Idaho 4th street. To send flowers or a remembrance gift to the family of Leonard Bunkelman, please visit our Tribute Store. "Email Address" would like to share the life celebration of Leonard Bunkelman. Click on the "link" to go to share a favorite memory or leave a condolence message for the family.